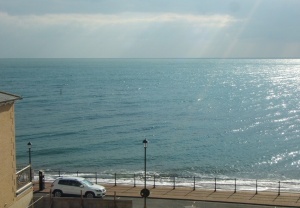 An immaculately presented and glamorous apartment in this attractive period building which enjoys great sea views and is literally a few steps from the beach. 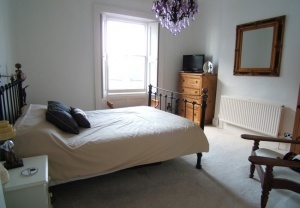 The apartment is lovely and light with two double bedrooms, period features including curved sash windows with original shutters and high ceilings with ornate coving. There is a parking space to the rear. From car parking area to the rear, a few steps down and main entrance door to shared hall and stairs up to first/second floor. 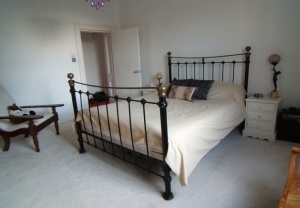 ENTRANCE HALL: 11�x 3�br />Entry phone, loft access and doors to all rooms. 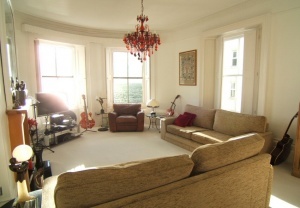 An elegant room with two curved sash windows to the front and a further sash to side. 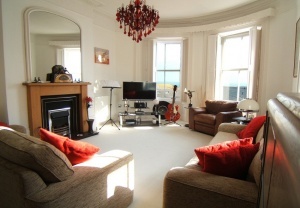 Lovely sea views, original shutters and ornate pelmet. Fireplace with granite hearth and wood surround and with coal effect electric fire. Radiator. 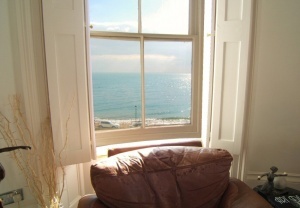 Two large sash windows to front/side with excellent sea views. 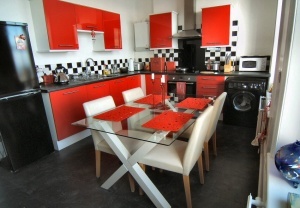 A fitted high gloss red kitchen with a range of base and wall units with tiled splash backs and black worktops. Built-in electric cooker and hob with stainless steel extractor hood above. One and a half bowl stainless steel sink with drainer and swan neck mixer tap. Space and plumbing for washing machine, space and power for fridge-freezer, wall mounted central heating boiler and two radiators. Slate effect vinyl flooring. 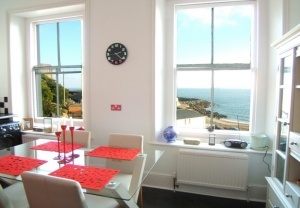 BEDROOM ONE: 13� x 13�br />Sash window to side with sea and beach views and original shutters. Radiator. 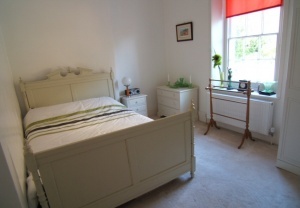 BEDROOM TWO: 11� x 11�br />Sash window to rear. Radiator. 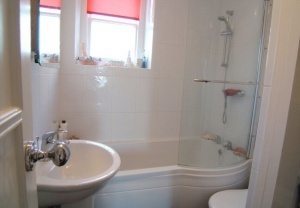 BATHROOM: 7�x 5�br />Sash window to rear. Slate effect vinyl flooring. A white suite with panel bath with curved end. Concealed shower unit above with chrome fittings and curved glass shower screen. Pedestal wash hand basin, low level w.c. heated towel rail. Open airing cupboard with shelving. To the rear of the building is a car parking area with an allocated space and additional visitor space. 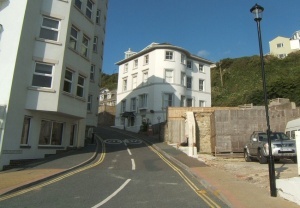 Above the parking area is a steeply terraced shared garden. 5) Internal square footage measurements are approximate and do not include hallways, bathroom/shower rooms or WC扴.